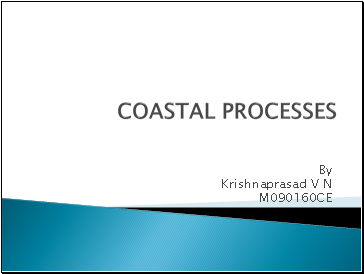 Coastal processes are the set of mechanisms that operate along a coastline, bringing about various combinations of erosion and deposition. The land water interface along the coastline is always in a highly dynamic state and nature works towards maintaining an equilibrium condition. The energy due to tide, waves, wind and currents is constantly working in the coastal zone. 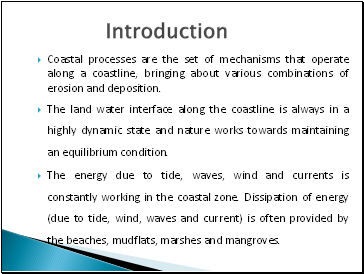 Dissipation of energy (due to tide, wind, waves and current) is often provided by the beaches, mudflats, marshes and mangroves. 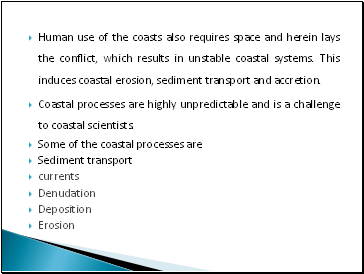 Human use of the coasts also requires space and herein lays the conflict, which results in unstable coastal systems. This induces coastal erosion, sediment transport and accretion. Coastal processes are highly unpredictable and is a challenge to coastal scientists. 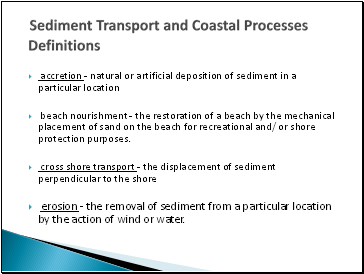 Sediment transport is the one of the important coastal process. 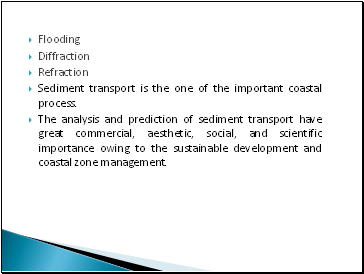 The analysis and prediction of sediment transport have great commercial, aesthetic, social, and scientific importance owing to the sustainable development and coastal zone management. beach nourishment - the restoration of a beach by the mechanical placement of sand on the beach for recreational and/ or shore protection purposes. erosion - the removal of sediment from a particular location by the action of wind or water. groin - shore perpendicular structure, installed singly or as a field of groins, designed to trap sand from the littoral drift system . 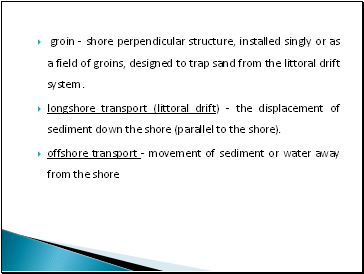 longshore transport (littoral drift) - the displacement of sediment down the shore (parallel to the shore). 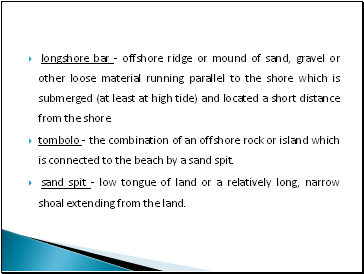 longshore bar - offshore ridge or mound of sand, gravel or other loose material running parallel to the shore which is submerged (at least at high tide) and located a short distance from the shore. tombolo - the combination of an offshore rock or island which is connected to the beach by a sand spit.